What rallies are all about … ! Although we have been H.O.G. members since 2009, Chris and I only went to our first rally in 2014. We enjoyed it so much we immediately booked another rally later in 2014, and then did three, including our own Heart & Soul Rally, in 2015. All were immense fun, so in 2016 we planned to try more. Benelux 2016 would be our first larger rally, and our first abroad. Chris only had one experience of riding, or driving, in Europe and I had none, so we would be doing this on his bike with me as pillion. 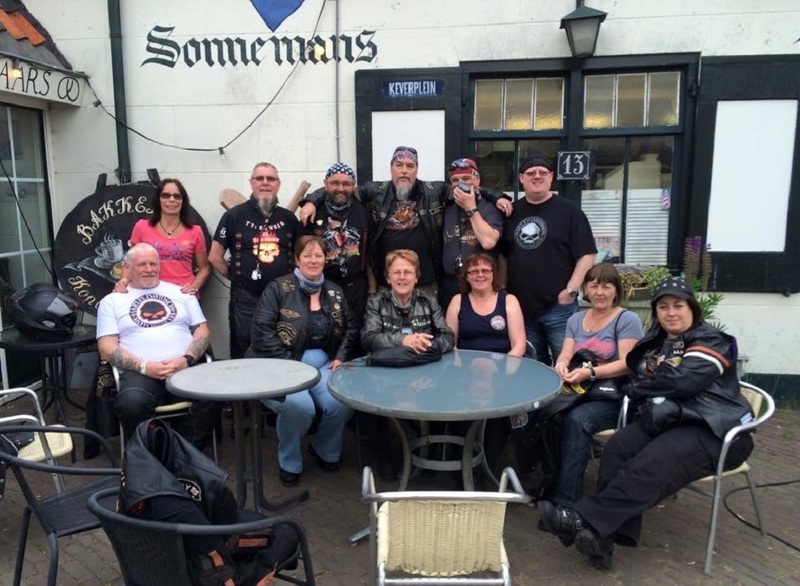 We regularly ride with a group from Geordie Chapter and we were delighted that twelve of us would be making the trip. Thursday morning arrived and we loaded our packs onto the bike and set off to join the rest for lunch near the ferry terminal. The weather that morning was absolutely dreadful with a really heavy drizzle. Needless to say lunch was rowdy, I dread to think what the rest of the customers thought of twelve soaking wet bikers as we greeted friends and sat down to eat until boarding time. It eventually stopped raining as we gradually crept forward to the check-in booth. I have never been on a ferry with a bike before and the whole process was a little unnerving. Eventually, we checked in and moved forward to board. Loading on a ferry as a pillion was interesting – I sat completely still as we ascended the ramps and Chris navigated the numerous bumps, cables and cleats onto the car deck. Apparently, we were lucky as there was a corridor just for bikes, away from the chaos of the cars. We unloaded our overnight pack, strapped everything down and headed for our cabin to change out of our waterproofs. An hour later, after a brief exploration of the higher decks, we established base camp on deck 8 in a suitable bar and settled in for the night. Dunedin Chapter appeared and the banter increased. Steve decided to play a couple of songs, on his harmonica, with the entertainer and a great night was had by all. After breakfast, we got to the car deck and waited ages to disembark and creep through passport control. We agreed who would lead from the ferry and that we would stop at the first services for a nice meal. We only had about 100 km to get to the rally site, south of Rotterdam. 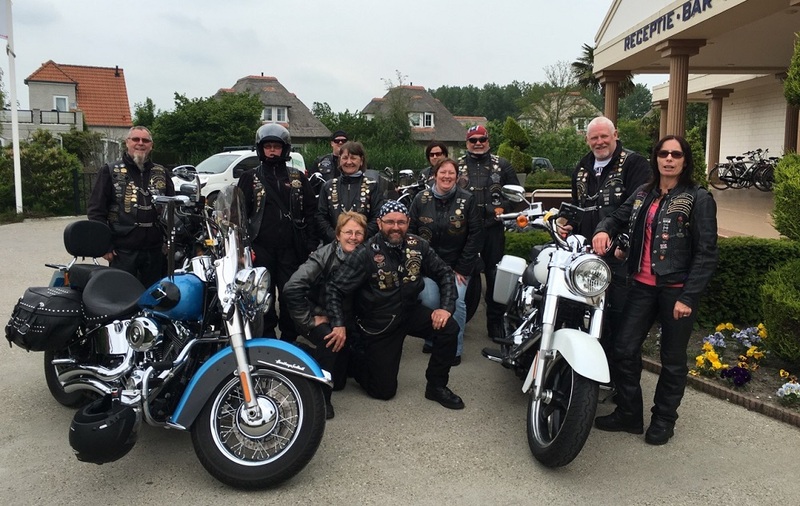 The weather was fine, the riding was great and the food was excellent – a far cry from UK motorway services. After an hour or so, we set off to find the rally site and get checked in. Somewhere around 2.00 pm, the Geordie Chapter landed at the site! 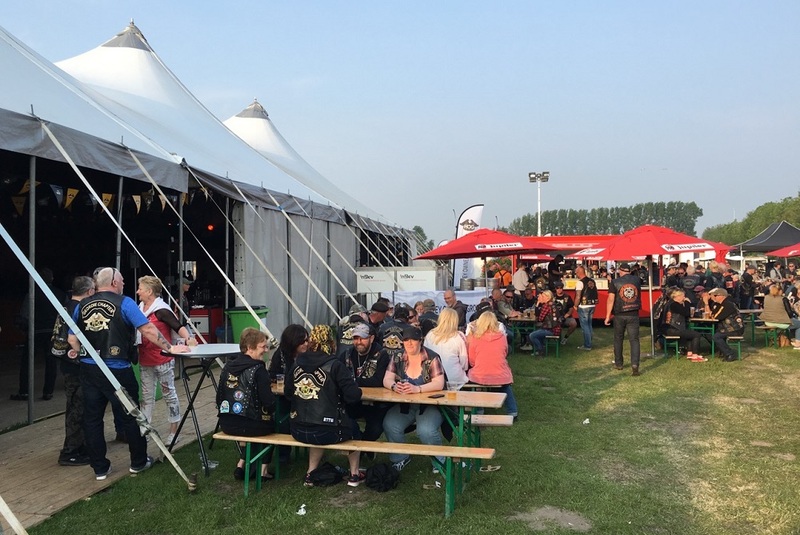 We checked in and tagged our bikes and headed through the camp to find our rally packs and get a cold drink – the weather was great and it was roasting! There were bikes everywhere. At the other end of the site, we were directed to the bike parking area and pulled in together to leave the bikes while we explored the rally site proper and collected our packs. The site was great – organised around outside tables, benches and a bar the village of about fifteen shops was selling a wide variety of things from food (excellent burgers) to Jekill & Hyde exhausts. To one side was the main marquee. This had its own bar with a stage and further seating and, to one end, a sectioned off local dealer shop with merchandise, bikes and even seat embroidery! Rally packs were collected, refreshing beverages consumed and we collected the bikes before stopping at the entrance to buy shuttle bus tickets for the weekend. 5 km later, we arrived at the chalet village and checked into two, three bed apartments. This would be our base for the next three nights. The self-catering accommodation was first rate and had its own restaurant and bar. Guess where we met ninety minutes later before heading to the shuttle bus pick-up point. Food was not going to be a problem this weekend as our rally pack included two breakfasts and Saturday night meal thrown in. The food was excellent, with plenty of choice, and it was all very well organised. The music and three bands on the Friday night were great and needless to say we partied pretty hard! 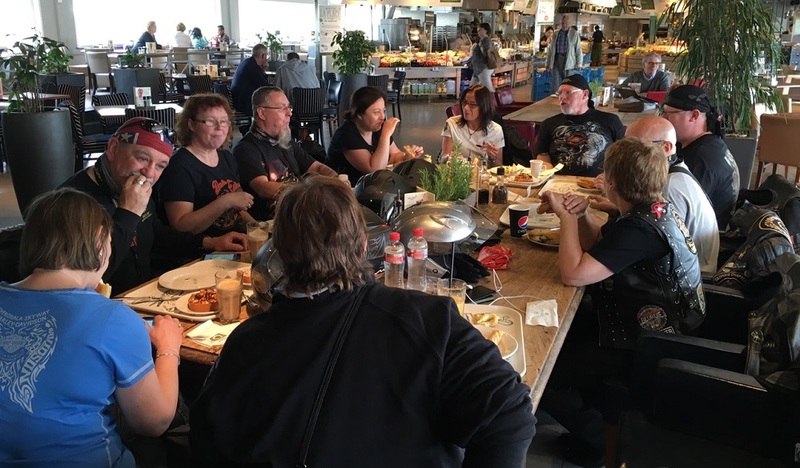 Red Rose Chapter and Dunedin Chapter were also there in force, as well as Sherwood Chapter along with loads of Dutch, Belgian and German chapters. We made lots of new friends, and had a fantastic night before heading back to the shuttle bus late in the evening. The walk to our chalets from the bus drop off was hilarious and somewhat difficult, as I seemed to be the designated responsible adult for the group. It was like herding cats – I’m sure some of our group didn’t remember the stagger home: Chris certainly didn’t. Saturday was a clear sunny day. We met up and rode back into the rally for breakfast about 10.00 am. Today, we planned to go on the mid-day ride to the Rotterdam dealer. So, after breakfast, we just chilled and chatted with folks until it was time to gather for the ride-out. There were other, longer rides available throughout the day and a L.O.H. ride. There were lots of self-guided rides, all available for download to your sat-nav – brilliant organisation again! The ride to the dealer was about 40 km and our group of seven bikes was directly behind the World Port Chapter road crew. There were about fifty bikes in total. With one guy at the back and two at the front, they managed extremely well to get us all there safely, and in one group. This was our first experience of marshalling outside the UK and they did a great job. We had an hour and a half at the dealers: there was a great range of accessories and clothes. They had also laid on live music and more food for us. We got back to the rally site about 4.00 pm, just in time for a quick shower and change and back on the shuttle bus for another evening of revelry. We took things a bit easier on Saturday. There were three bands again, from 4.00 pm to midnight, the last two of which were excellent and large marquee was packed to the rafters. We had a hilarious ride back on the shuttle bus with a few from Red Rose Chapter – the banter was fantastic. On Sunday morning, we returned for our final inclusive breakfast and some last minute shopping before the rally closed. Instead of the parade of flags, we headed into the countryside, in search of a small village bakery that featured on one of the Hairy Bikers’ shows. An hour later, we pulled up outside for excellent coffee and pastries and explored the eclectic collection of 1940s memorabilia at the bakery. With full stomachs, we then headed back after stopping off to buy some supplies for our last night at the chalets. Monday saw us split up with six of us heading home and six heading onto Arnhem, to the museum and bridge to pay their respects. We had some pretty bad weather during the early part of our ride back to the ferry but it was only the first that we’d encountered since leaving the UK. Bill led us on a great run, despite some patchy sat-nav performance, and all arrived in plenty of time. Unfortunately, we had a rather lumpy return ferry journey. We have learned on this trip that the rally itself is only part of the mix. Yes, it provides the location and backdrop, but that makes a great rally is the people you are with. Our group is the maddest, most hilarious and best group of friends we have ever had. The rally was excellent, the venue, food, music and location great, and the weather fantastic. But without the company of these people, it just wouldn’t have been the same. The saddest part is that we cannot do it again in 2017 as we’re going riding in the USA. Roll on our own Heart & Soul Rally at the end of July and Thunder in the Glens in August. All being well, next time I go to the Benelux rally I will be riding my own bike, rather than pillion with Chris. Can’t wait!